In February we were second best second city – according to a BBC poll – and the rudest city in the country – according to a crap survey promoting a crap supermarket. Still Lawrence Llewelyn-Bowen had some nice words to say about us on the Holiday programme, encouraging visitors to pop into town for a city break. The English Tourist board were also tempting visitors to the fleshpots of the city – specifically Saramoons (as apparently Duran Duran formed there), for a Pino Grigio no less. Not a pint of M&B mild and a fight, which is more usual. March was big on weird goblin-y things, not only did a frankly bizarre Tolkien statue for Moseley get planning permission but it was, of course, Birmingham’s annual leprechaun, Guinness and green things pageant – the St Patrick’s day parade was rained on, but as huge and popular as ever. What wasn’t popular was anything produced by Heinz – as they reneged on their promises and shut our wonderful HP Sauce factory. Self-publicising John Bull character Ray Egan climbed to the top of the tower with a ‘Daddies For Justice’ banner – and we never bought anything made by Heinz ever again. Ray Egan was at it again in April, fiddling on the roof of Harbourne Post Office – but who is the lovely smiling lady in the foreground? 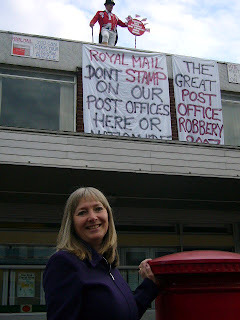 It’s Harbourne Councillor (and Edgbaston Conservative Spokesperson) Deirdrie Alden – who is perhaps Birmingham’s most consistent blogger, one post a day, every day, one photo, no comments. Towards the end of the year Deirdre would become worthy of parody, was she in April? Brum’s other internet councillor, or auteur, Mr Mullaney was targeted by some people with very good handwriting – but by this time there were quite a few people upset with his videos, so I doubt it was clear who was responsible. It didn’t stop his videos tho’, keep going Martin. Probably the best news story of the year was in April, when the Daily Mail discovered a cat who takes a TWM bus every day on his commute to the local fish shop. No reports on whether he smokes catnip up the back of the number 50. May was the month that the Council and the Bull Ring both announced plans to build ‘urban beaches’ for the summer, apparently inspired by something similar Paris had done a few years ago. The row made it to the national media, although they really used it a a bit of light relief featuring some comedy Brummie voices. Meanwhile on t’interweb, more and more tiny bits of Brum got their own blogs – Camellotment is a blog about plot 171 of the Moor Green Allotments, in Cannon Hill Park, and you can’t get more niche than that. The Bull Ring fired the first shot in the sand war, and opened its sandpit. We used an obvious pun and got all manner of comments haranguing us for not falling at the feet of this promotional tool – but it wasn’t really to matter as the Bull Ring beach, the Council’s Chamberlain Square one, the RNLI’s Brindley Place one and the volleyball Centenary Square sanded areas were all washed out by one of the wettest summers imaginable. It was enough to make you stop in and watch telly – lucky then that Jasper Carrot launched his obscenely convoluted quiz show ‘Goldenballs‘. The show required so much concentration that you needed to have a lie down afterwards, in a darkened room. We went down to the darkest room of all, perhaps, as part of Architecture Week – the tunnel between the Mailbox and New Street Station. Rootsville was a blindingly ambitious and blindingly weird festival that we loved, more next year please. June was a month to launch campaigns too – the first stirrings of what was to become Keep Digbeth Vibrant, er stirred up on, gawd, The Stirrer. The fight still continues. 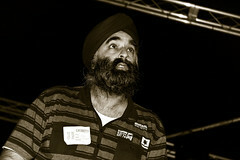 We were in angry mode too, and announced Talk Like A Brummie Day. TLAB Day, as we unwieldingly acronymed it, took almost all of our energy in July what with constant rounds of press, TV and Radio appearances, and trying to work out exactly where on the road to Sandwell the word ‘bostin’ kicked in. Luckily there was loads going on to take our minds off it – an art space turned into a real ale pub, symposiums on the heritage of metal in the midlands, the best damn festival (it says here) in the world. We got all worked up over nothing in August, there were rumours (from staff, no less) that The Jug of Ale was to close – people ranted, and were generally horrified – but in the end it turned out to not to be true. 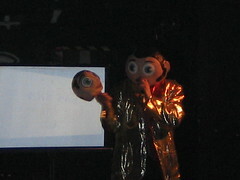 At least it gave us and excuse to have yet another tenuous picture of Frank Sidebottom on the blog. It’s scary that despite really caring, the gig going, and drinking, public have absolutely no power over things like this – there really needs to be some sort of plan to save our beloved toilet circuits. September was dominated by Artsfest, Artsfest in turn was dominated by the bloody huge, bloody loud, bloody brilliant Blast – which was fire and industry and trains and a barking review from us that was obviously written with the experience still ringing in the ears. Something else that’s just as barmy is the VTP200 – a huge tower planned for Eastsiiiide – that was announced in September. It’s pointy and tall and odd, and you’ll be able to chuck yourself off it in relative safety. The UCE was changing its name, and we got wind of the alternatives – including the eventual winner Birmingham City University – but resisted the inevitable Aston Villa University joke ©every bloody commentor on all of the blogs in Brum. It’s not often we get to take the humour-high-ground, so we’re milking it. The highlight of October was without doubt the Plus International Design Festival – including all sorts of lectures, a real-life pacman game, a top party, and for me at least a free tour of Birmingham – focusing on typography (not so much of a niche market as you’d think). October was also awash with ‘something days’; National Poetry Day featured poets sauntering around the city dressed in their pyjama, Blog Action Day featured us coming over all environmental, and Badger Medical Centre day – well, I just made that up. On BiNS November is awash with the hustings for the Brummie of the Year Award – Pete Ashton decided he wasn’t worthy, then campaigned like a trojan – but enough of that until December. Gigbeth happened, and for reasons lost in the midst of time we decided to refer to it as Igbeth, it was a huge glob of everything that’s brill about Brum’s music scene (with a few bits that are bad too). It gave us the brilliant sight of three or four bands all playing at the same time (and even sometimes the same song) in the middle of Digbeth High Street – I’m sure it will be back. There was also the Pantomime Horse Grand National, which got all charity-ed up and moved well outside the pantomime season. Given that the horses aren’t pantomime horses either, I wonder how far removed it will be next year. I’m making a stand of calling for it to be renamed the Pantomine Horse Grand National, since that’s how us Brummies pronounce it anyway. We didn’t win. Winterval kicks of with the crowning of John Tighe Brummie of the Year 2007 – a close run thing, but there wasn’t anyone disappointed with the result. John made a speech of sorts on our blog, but for the life of me I can’t tell you what he was on about. Noddy Holder got a star on the ‘Walk of Stars’ on Broad St – arriving in the most black country way possible on a Glam Rock Canal Barge. I have no idea exactly how glam rock it was (platform shoes for legging-it through the tunnels? ), but we were pretty well disposed to the Black Country for the month – as they went up for £50 Million of Lottery funding. They didn’t win either. 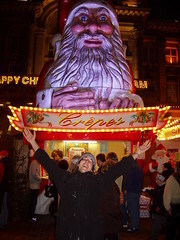 December of course brings the German Market to Brum, being so popular and photogenic that it’s been a struggle not to have every picture in our advent calendar of Evil Santa. And that just about wraps it up, I’d envisioned doing more jokes about sand. Have you got any good ones? 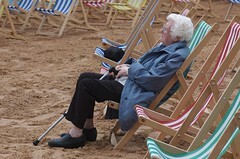 Or more general Birmingham 2007 memories or thoughts?